Secondus noted that it would be disastrous if Nigerians fail to vote out the All Progressives Congress, APC, by next year. The PDP Chairman charged Nigerians to see 2019 as the restoration year for the country. 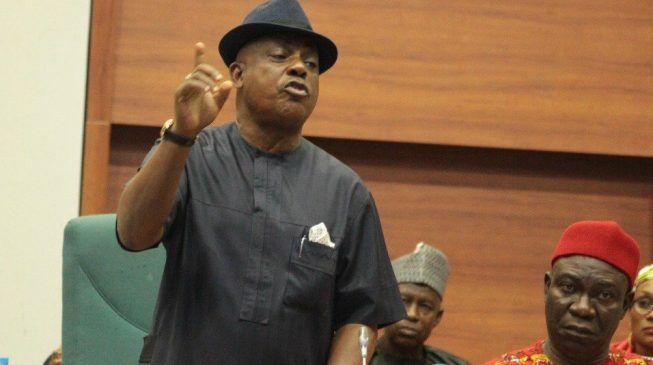 Prince Secondus said that the year 2019 was critical in the life of the nation as it would be a turning point in the emerging political evolution. Secondus said that the future of the country lied on the voting decisions the people would make in the new year. He said, “The general election in the country this year 2019 provides ample opportunity for the country to be rescued and restored as the biggest black nation in the World both economically and politically. “This year provides us the ground to save our democracy and the country from the comatose state the misrule and inept administration of the All Progressives Congress, APC has placed it. “2019 provides the way for us as a country to correct the mistake we made in 2015 which has dangerously brought the country to this sorry state. “Our nation did not bargain for this quantum of avoidable blood letting and loss of human lives when it voted in 2015. “Nigerians did not vote in 2015 for their economy which was the best in the continent to be so damaged to merit her the poòr capital of the World. Against these backdrops, the PDP boss warned that it would be a huge disservice to the nation and invitation to anarchy if the Independent National Electoral Commission, INEC, fails to give the country free, fair and credible election this year to enable the will of the people prevail on who governs them. He warned that huge consequences awaited anybody who whether directly or indirectly does anything to undermine the will of the people by trying to manipulate the electoral process. Prince Secondus specifically admonished the security agencies in the country to always have at the back of their minds, the fact that their responsibility is to Nigeria and Nigerians and not to a particular government in power at a time by remaining transparently neutral in all political matters. “Anything otherwise from security agencies during this electioneering and always amounts to great disservice to the people of Nigeria whose tax pay they use for their upkeep,” he added. Prince Secondus expressed worry that if PDP elevated Nigeria’s democratic status by introducing electoral reform that saw it defeated and had a seamless transition to an opposition, democratic world should be concerned at the refusal of President Muhammadu Buhari to sign an amended electoral act that would have facilitated a smooth and transparent election. In wishing Nigerians a prosperous and trouble free new year, the National Chairman, however, advised them to take their destiny in their hands by not only coming out massively to caste their votes but to be ready and prepared to defend it. Prince Secondus finally urged the global democracies to show more than passing interests in the Nigeria general election because of the strategic importance of Nigeria in the Democratic community in Africa.